32 pages of coloring, puzzles, mazes and activities for Christmas. 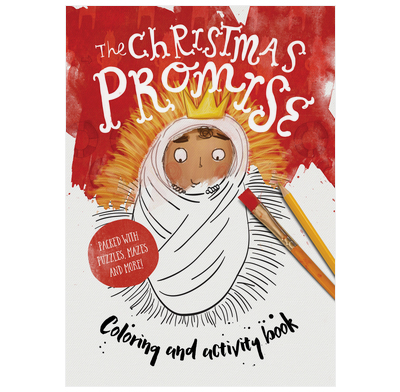 Use alongside The Christmas Promise to discover exactly how God kept His Christmas Promise by sending his New, Forever, Rescuing King. My 6-year-old grand daughter enjoyed this - but we will have to finish it next Christmas! I do not want to be too critical... To be truthful, I personally prefer clearer pictures. I had nothing against the puzzles,mazes, word searches etc but I fet there was nothing that STOOD OUT to me. Perhaps if I had bought the story book it might have been different. In actual fact I used some other material I had already for that. The colouring poster was good and well received by the children. Sorry. We used this poster as a colouring activity at our mid week clubs, and children and adults alike enjoyed choosing a bit to colour and working together at it. The large size meant at least 4-6 people could work on this at the same time. The words provided a helpful talking point - what does Forever King and Rescuing King mean etc? It looks nice displayed on the wall too! My children have had a lot of fun colouring in this poster- it has taken up several hours and reminded them of who Jesus is and His birth at Christmas.